OK this may be obvious but it warrants saying: dishes pile up fast and the best way to prevent an entire sink full of dishes at the end of the day is to keep up with them. Use a few minutes after each meal (if possible) and put the dirty dishes in the dishwasher. Bonus if you also get to wash the dishes that are not dishwasher safe! I’ll be honest and say that I do not have a real laundry day at home. For us, it makes much more sense to keep it as an ongoing task. After all, even if I caught up on all the laundry today Little Grasshopper might make a huge mess of his clothes tomorrow and I’ll have to do more laundry then anyway! With that being said, it only takes a few minutes to throw a load of laundry in the wash. And unless you have to use a laundromat for your laundry, there’s no reason to wait around while the washer runs. Do errands and/or take your kids out! Trust me, it will be OK if the washer finishes before you get back to it. I promise! Alright, I know that my family isn’t the only one who makes a game out of how full we can make the trash bag before we take it out. That’s right, I called all of us out on our laziness. Really, “just not feeling like it” is a poor excuse for not taking the trash out. If you have 5-10 minutes, just do it (or make it a chore for one of your kids if they are old enough)! If you’ve been hanging out on The Modern Nest a lot, you probably already know that I’m a fan of dealing with mail as soon as it comes in the house. However, if you have let your mail pile up, take short bursts of time to go through it. Will you get through all of it at once? Probably not (depending on your mail pile size); but chances are the mail didn’t pile up all at once, either! Just keep doing bite-sized pieces! I used to be one of those people who thought making the bed was a pointless endeavor. After all, I figureed we just “undo” it when we get back into bed at night! But y’all… in the past year or so I’ve experienced a bed-making opinion transformation! As it turns out, making your bed (even if it’s not first thing in the morning) adds a huge sense of accomplishment to the day! In addition, it makes the bedroom look so much more put together and organized so you feel relaxed when you do crawl into bed at night. Go ahead, try it! I don’t know a single person who enjoys calling and making appointments. However, I do know that most people feel like they got something accomplished once they do make their necessary appointments. So, stop procrastinating scheduling your annual physical or oil change and take that five minutes you have to make the call! Have you ever accidentally double booked despite having a calendar with everything in it? I have. And it’s normally because I didn’t have my calendar on me and mixed up dates by mistake. If you take a few minutes when you have a few minutes to look at your calendar and remind yourself of upcoming obligations then you’ll avoid double booking like I have and ultimately making more work for yourself! If you are trying to save money or feed your family healthy food then you’re probably making home-cooked meals. And if you’re making home-cooked meals then you’re probably meal planning. And if you’re meal planning then you should be doing food prep. If you have a few minutes you can either plan out your food prep or do a simple food prep task (such as rinsing vegetables and letting them out to dry). 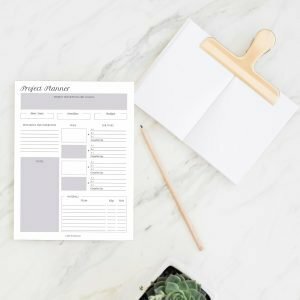 If you need help getting organized with food prep, join our community and get my free mini planner. 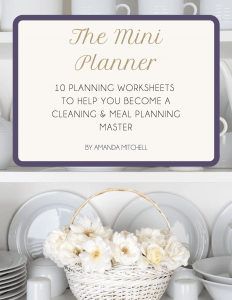 The planner contains a full 4-page meal planner complete with a food prep sheet! If you find yourself complaining or getting annoyed a lot by your home’s shortcomings, then take some time to brainstorm/plan solutions! Finding solutions to your home will make everything run more efficiently, and you’re likely to be a happier person in the long run! 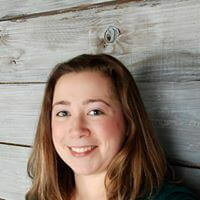 Do you have a habit of always adding things to your purse/diaper bag but not regularly cleaning it out? Don’t worry…me too! I’ve been guilty of thinking that I only had 1-2 diapers in my diaper bag only to find out there’s more like 15 taking up space in there because I haven’t gone through it in like days weeks months. So…if you have a few minutes go through your bag and tidy it up! If you’re lucky, maybe you’ll even be able to put off buying diapers for another week! 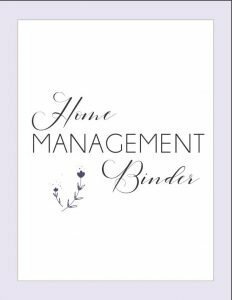 So there you have 10 home management tasks to do in 15 minutes or less. How do you make the most of your short periods of time? Let us know in the comments! 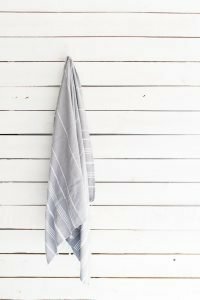 For more home management advice, check out the two-ingredient all-purpose stain remover and how to take your home cooking to the next level! I agree that doing dishes right away (and every day) is very helpful. There are times that dishes get back up for two days or so. Then there is a huge mess and it takes forever to clean everything up. My new goal is to empty the dishwasher / put away any dishes right away in the morning. Then add any dirty dishes to the dishwasher / handwash any dishes. That way I can add dirty dishes to the dishwasher throughout the day and start it once it’s full. So much easier. Yes! This is almost exactly what I do! I used to be able to get away with not doing the dishes every day when I didn’t have a family, but as soon as I had a kid dish battle was on! Good luck! Ha ha, when I got to number 2 I remembered a load of laundry I’d put in the machine earlier this morning that needed taking out! Thanks for the reminder! Seriously this is a great list, little and often makes all the difference. Hy Julie! I’m glad you found it helpful! And I agree…I’m definitely not the kind of person to try and do all the cleaning, laundry, dishes, etc on one day. I have to spread it out so it’s not overwhelming.